Poor tiny Birdie has no house. But Birdie does have friends. Spike, Queenie, Goldie, and Fidget want to help Birdie find a house of his own. 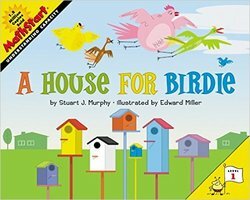 Birdie needs a house that isn't too tall and isn't too thin, that isn't too short and isn't too fat, and that isn't too wide and isn't too narrow. Will they find a house for Birdie before the rain falls and the wind blows? A sweet and simple story about helping out a friend explains the math concept of capacity - what will fit in a container of a particular shape and size.